The focus of the modules this week was Ayurvedic medicine, and that includes eating in order to balance, or keep in balance, your dosha. We were asked to share some recipes that we enjoy that include a range of tastes (based on the six tastes: pungent, sweet, salty, bitter, astringent, and sour). I have two recipes here, both are Indian recipes, and are delicious! The first is a Goan vegetable curry. I love this curry (when I can muster up the time, energy, and effort required to prepare it!). The second is a mild spinach, potato and pea curry that my whole family loves. Use fresh seasonal vegetables of choice in this curry. In a small saucepan or a wok, on medium heat, put in all the spices and dry roast until the coriander seeds turn golden brown and the spices begin to emit their aromatic flavours, about 3 to 4 minutes. (Note: You may have to decrease the heat, if the spices begin to burn or turn black.) It is absolutely essential to make sure that the spices don’t turn black. In a blender or food processor, put in the coconut, tamarind, ginger, turmeric, the roasted spices and 3/4 cup water and grind to a fine paste. In a saucepan put in the water and the cut vegetables, cover and cook till done, about 10 to 12 minutes. You might want to add cauliflower after the carrot and beans are half cooked, to prevent them from turning mushy. After the vegetables are cooked, add salt and the ground paste and bring to a boil. You could add 1/4 to 1/2 cup more water if you want a thinner gravy. In a small wok or saucepan, heat the oil over a medium flame, add in the mustard seeds and when they pop, put in the red chillies, curry leaves and asafetida powder, mix once and pour this into the vegetable curry. 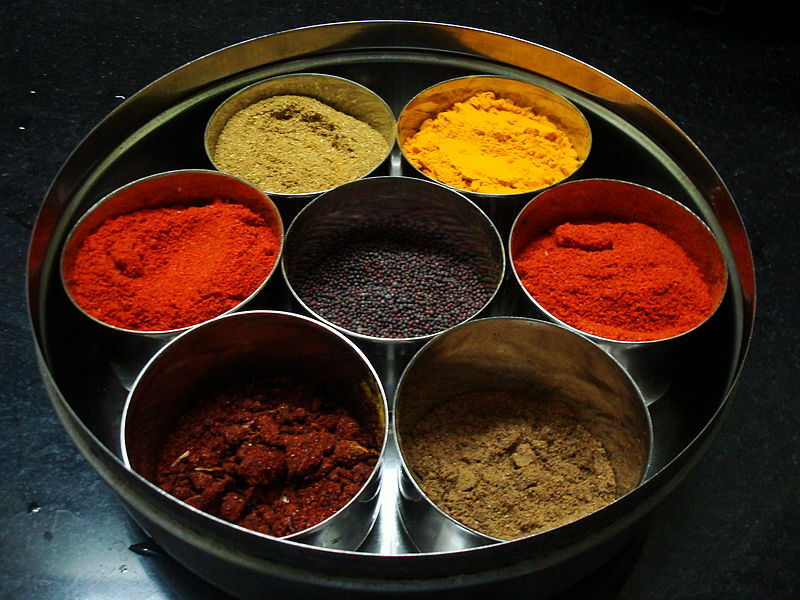 Give it a good mix and serve hot with rice, rotis or parathas. I love to serve this curry with plain basmati rice and some plain yogurt which makes for a balanced satisfying meal. In a medium sized wok, heat the oil over a medium flame. Drop in the cumin seeds, ginger and green chillies. Stir for a few seconds and put in the asafetida, turmeric, salt and grated tomatoes. Mix in the cumin seed powder, red chilli powder and sugar. Cook until the oil separates from the tomatoes, about 4 to 5 minutes. Put in the cooked peas and potatoes and cook for about 2 minutes. Stir in the spinach and chopped coriander and cook for 2 to 3 minutes more or until the spices are properly incorporated into the vegetables. Serve hot or at room temperature with the rice or bread of your choice.